Are your children interested in learning another language? If so, then keep reading for today's review on Middlebury Interactive Languages. They offer several different language courses and grade levels from kindergarten to high school. We were given the chance to review High School Spanish I. 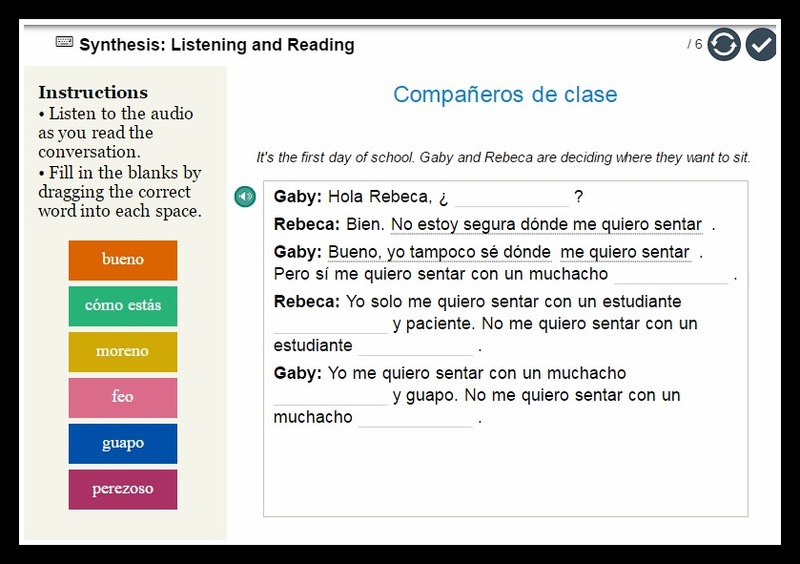 High School Spanish I is an interactive digital course where students can immerse themselves in the language and culture of the Hispanic world. The course is designed to complete a lesson per day for 18 weeks that equates to one semester. We were given 2 semesters to review. The set up is easy to follow and boxes are automatically checked off as a student completes a lesson. The course teaches language skills though listening, speaking, reading, and writing activities. 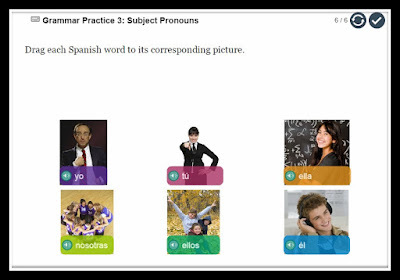 There are also culture slides included with native speakers showing different ways that the different countries of the Spanish-speaking world may translate words. For instance, most countries refer to a teacher's desk as escritorio but some may call it pupitre. Students are also introduced to some Spanish customs such as how they greet one another, food, education, markets, etc. Lesson 1 - gives the objective for the unit, introduces the new vocabulary, and gives the student activities to practice what they have learned. One of the activities included dragging the matching vocabulary word into the space as seen below. The words the student has not been introduced to yet are underlined so they can click on them to find the correct meaning. Lesson 2 - continued vocabulary practice, grammar introductions and review. Here is a grammar practice lesson with subject pronouns. The student had to drag the Spanish word to the corresponding picture. Lesson 4 - continues to review what has already been taught and introduces a culture tidbit with a quiz. There are also midterm and final tests given during units 9 and 18. You have the option of adding teacher input to the course for an additional fee. If you do not go that route, you will need to check a few of the assignments yourself. However, most are self graded. The student receives a participation grade on the speaking portions so you will want to check to see how they did there. You can examine each of your students activities easily in the grade book section. This course is simple to navigate and the lessons can be completed by the student on their own. I sat with my 9th grader for most of the lessons to refresh myself on Spanish because I have forgotten most of it. I also think it is great when you can use words in daily life as a review. He is really excited about the course and enjoys the lessons. There is also a calendar tab where you can find all the lessons preassigned to make sure you complete the course on time. It does not allow you to move any of the lessons around which would be a wonderful feature for homeschoolers because we don't always follow a traditional calendar and during basketball season we even school on Saturdays sometimes. However, your subscription does have an expiration date of one year from purchase date so timely lessons are important. We really never used the calendar feature and just completed the lessons in our own timing to fit our schedule. Find out more on Middlebury Interactive Languages and the courses they offer in Spanish, French, German, and Chinese by visiting Twitter, Instagram, Facebook, Pinterest, and Google +. Be sure to click the banner below for other reviews on these courses.